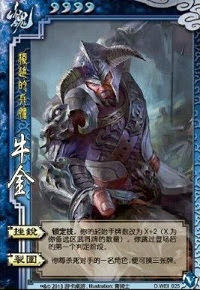 When Niu Jin enters the battle, he draws an additional X+2 cards. He also skips the judgment phase of his first turn. X is the number of generals that are still face down. When Niu Jin kills a player, he can draw three cards. "Sharp Setback" is designed for use in 1v1 mode. Niu Jin can be used in a normal games however. X is then fixed at 1 allowing him to draw 3 extra cards for a grand total of 7 to start the game with. He also still skips the judgment phase on his first turn. Niu Jin only skips the judgment phase on his very first turn of play. He must skip it as it is not an option. Every other turn afterwards does not have this attribute to it. The judgment phase is taken normally. "Unbroken" works after all other effects take place. Any dying powers happen first, such as Bu Lian Shi's "Memory". If Niu Jin is in a standard game, this effect in compounded with the role of the person he killed. If it was a rebel, he would draw both sets of three cards making six altogether. If he killed a spy or loyalist, he draws three. If Niu Jin is king and kills his loyalist, he loses everything and then draws three. He will end up with at least those three cards no matter what.